Video wars again but not betamax versus VHS but Google’s YouTube versus Murdoch’s MySpace. MySpace have taken the gloves off and recognised the huge market and video demand in the social space. YouTube, dominants the online video space and its market share continues to grow. A recent Hitwise report stes that their share has grown 70 percent since January, compared to MySpace Video's 13 percent growth in the same time period. YouTube's current market share is 60% compared to MySpace Videos' 16%. MySpaceTV will be an upgrade to the video site it launched two years ago, and will showcase premium content like the Sony Minisodes, which debuted on MySpace last week. These feature short clips of classic TV shows, alongside user-generated content and other sophisticated Internet video offerings. MySpace has announced a handful of deals with the usual content partners, including National Geographic, The New York Times, Reuters, Fox's IGN Entertainment, Animation Show and the Daily Reel. It will not only be open to Internet users who do not have an account on the social networking site, but MySpace users will be able to create their own TV pages by uploading videos to the site. Intrestingly, when YouTube first launched, MySpace was its largest source of traffic, and that it continues to be a large driver. With the advent of TV services such as Joost and iPlayer it is going to be a crowded space with many vying from the same eyes. What is clear is that the video, film and TV worlds are changing. Whilst many edge their bets and make much noise, some take action. Both strategies may be right, but it is interesting to see the continued rise of Taylor & Francis in the digital world. This week it’s parent Informa, announced that its publishing divisions are all continuing to grow from the move to electronic delivery of information and services. Taylor and Francis is an example of a publisher who has fully embraced the digital environment and its opportunities. In a statement they say, "The increased utility and customer value from digital delivery has provided extra pricing power and market penetration. Digital archives, data services and daily information provision have all contributed to good growth further enhanced by cross leveraging event brands and publishing PI intellectual property." Taylor and Francis was one of the first to take bold steps into the digital world and now has some 17,000 book titles fully available in all formats, some 150 plus web sites and this is not the only digital programme that they have successfully achieved. Their foresight and ability to read opportunities and move quickly to capture growth is an example of recognising that Digital Publishing is now Publishing. We know where you all are! Imagine a birds eye view of traffic across the Uk and not only can you see the congestion areas but you know the speed of all the vehicles. Now add information about the programmed journeys and directional flow of traffic and you can send everyone down the same rat runs and on. Its quite frightening and makes one wonder about privacy and the big brother world we are now entering! Seriously, being able to see the flow and speed of traffic and plans of drivers is powerful information. TomTom has announced it is to work with Vodafone UK on developing such a new traffic information system. It will collect information from Vodafone on the location of mobile phones to provide real-time information on the speed and direction of cars travelling on all major roads across the UK. The service is expected to launch in the first half of 2008, when further details will be made available. The system will also be available for road authorities and businesses, who may use it for dynamic traffic control management and improved fleet management. The BBC enters the "iWorld" with a beta version of its on-demand TV service, iPlayer on 27 July. It will be only available to UK licence fee payers and will offer programmes from BBC TV channels to watch on the PC. Users will get access to programmes for up to a week after broadcast and they then have 30 days to watch it. After viewing, the file deletes itself from the computer. Later this year, iPlayer will become widely accessible with links from YouTube with many others such as AOL, Tiscali, Yahoo!, MySpace, and Bebo planned. It also hopes to expand to handheld devices such as mobile phones. The iPlayer was developed by the BBC's Future Media & Technology division in partnership with Siemens and Red Bee Media. One Day to go to Lift off!! Forget Harry Potter there will always be crazes and next year there will be another. Live live the King! Its now only hours to the biggest awaited and potentially landmark event, the US launch of the iPhone. The New York Times claims that there have been over 11,000 print articles about it in the last 6 months and that it turns up about 69 million hits on Google today. Forget Wimbledon tickets, there are people are camping out in front of Apple US stores today. Anyone who hasn’t seen it or need to understand what it has click here to visit David Pogue’s NY Times walkthrough of its features. Let’s not dwell on it limitations, it has many. We know there will be several versions before its perfect and Apple has a good track record with the iPod of constant refinement and improvement. It may appear expensive at $500, limited in battery life, has no memory-card slot, no chat program, no voice dialling, can’t handle Java or Flash, no MSM picture swapping, text entry is a new skill that doesn’t need those trained Blackberry thumbs, and finally in the US, there is a sole AT&T network supplier and its implications. But even in version 1.0, the iPhone is still the most sophisticated, iconic designed and importantly lifestyle-changing electronic device to come to market in years. It does so many things so well, web graphic, email, voice mail. You can enlarge text, web pages or images, rotate the screen which automatically adjusts the image to the wide views. The iPhone is also an iPod. The iPhone downloads music, videos and photos from your PC. The Google Maps module lets you view street maps or aerial photos for any address. The iPhone isn’t GPS so route directions are interactive today, in the US it gives free live traffic reporting, indicated by color-coded roads on the map. Anyone who doubts technology convergence to the mobile and that we still need clunky tablets just to read books please leave the room as you’ve missed the plot. It may appear to be a long way off from setting up shop next to more traditional vending machines,or the local bookstore but those in New York CIty can now get their instant-book from the library. The Espresso Book Machine, which was successfully demonstrated at BEA this month has now been ibstalled in the New York Public Library's Science, Industry and Business Library. It contains over 20 titles from the Open Content Alliance database, which visitors to the library can print off as books free of charge. Do the readers care if its printed on demand? It certainly is hot off the press and importantly the titles are never out od stock. The Espresso manufacturer On Demand Books appear to be attracting attention and potential takers for the machine, with the New Orleans Public Library, the University of Albe rta, the Northshire Bookstore in Manchester, Vermont, and the Open Content Alliance in San Francisco each already in line to get one this fall. When will the price drop to that magic figure that wakes up bookstores to installing ing it. I bet Starbooks are keeping an eye on its development. R.R. Bowker, the bibliographic information management company, has announced that it has acquired Medialab Solutions by Amsterdam. Medialab are the creators of AquaBrowser Library search and discovery platform which is used by more than 60 million patrons in public libraries throughout the U.S. and Europe. The acquisition mergers one of the richest collection of bibliographic data sources with what isd repected by many as the most popular and user-friendly visual faceted search technology in the library industry. AquaBrowser Library seamlessly integrates with major library systems, opening up both the library catalog and any other information sources. Through AquaBrowser Library, libraries can offer the finest user interface available today, without changing the way they work, their existing systems. This gives Bowker a significant opportunity to develop new librarian services and fight what many would regard as an eroding market in this new world of increasingly rich digital context..
On Friday it happens! 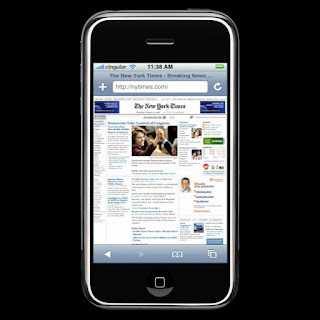 The iPhone launches in the US and is set to be a landmark shift in the convergence of technology, content and design. AT&T-owned stores will close early at 4:30 p.m. and reopen at 6 p.m. to sell the iPhone for the first time. Some Apple stores are not planning a pre-6 p.m. shutdown before the iPhone goes on sale. Still, other Apple stores did say they were going to shut down as they got ready for the onslaught of want-to-be iPhone customers to fill their stores. Proving that its not just Potter that gets the queues. Before its hits the streets content providers are recognising that we are moving from the often clunky presentations of web offers over the mobile networks to one which mirrors the online world, is slick and potentially one that will define much for the next phase of mobile evolution. Steve Jobs and the Apple team come at it from a different perspective. They have designed their own application so consumers can receive YouTube videos through a Wi-Fi network and this could lead to even more consumers bypassing traditional networks altogether. This will not be Mr. Jobs’s first experience in redefining an industry. Many hailed Mr. Jobs as a saviour when the iPod was introduced in 2002 because it was an alternative to the illegal online music sharing. Three years later, the music bosses are deriding him over pricing. But let’s get real, he was not to blame for their ‘head in the sand’ attitude to pricing, but merely exposed the price point needed to engage the consumer. 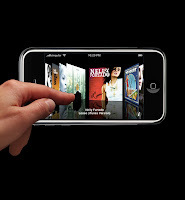 Now the major film studios are cautiously resisting Apple ’s overtures to put movies on the video iWorld. They want guaranteed copyright protection and reduced prices. The reality it will be dictated by the consumer and the likes Jobs. When it happens it is obviously better for the film studios to be inside the tent than outside. Imagine what Jeff Bezos is thinking as he prepares to launch his Amazon/Mobi reader? Will it end up like that much hyped but doomed from the start Sony ebook reader which failed to capture the consumer’s imagination or find real content. It is hard to see it capturing the same level of hype as Apple’s iPhone. Many are merely waiting with open mouths for Friday and a ‘New World’ start. Scholastic is launching BookFlix, an educational Web site pairing short films based on popular picture books along with nonfiction e-books that allow early readers to follow the text online. This starts to introduce multimedia content in the jacket and may show an animated film of a storybook, where children are able to turn pages, backward or forward, by clicking on an arrow on the lower right- or left-hand side. Disney Publishing Group plans a similar project later this year, making favorites such as "The Jungle Book" and "Cinderella" available online and while Scholastic, is sticking to the school and library market, Disney will offer books to general consumers. Some remain skeptical as to whether the children’s market is ready for ebooks and believe that a laptop device may be a more acceptable delivery device. But it is the content that counts and Scholastic and Disney are not standing still and waiting for the market to make up its mind. BookFlix begins with 80 pairings, 20 of them also available in Spanish, with categories ranging from "Family and Community" to "Music and Rhyme." They are working with US schools, teachers kids in small groups and have received enthusiastic responses so far. Imagine no more ‘read with mother ‘ but ‘click with mother’. The Russian delegation at the IBF conference last week in Cape Town raised a few eyebrows with their latest book buying scheme. It certainly made a change from the fixed price phobias from other delegates. Their ‘Second Life of a Book’ scheme has recently started and enables bookstore be returned to any bookstore that stocks the title. No receipt required and as long as the book is in mint condition the retailer will hand back 50% of the retail price of the book. They don’t give it refund in cash but in the form of an electronic top up on a book debit card. The book is then returned to the shelf and sold at 10 to 15% discount. The returns can also only be done between the hours of 10 and 10 on a Saturday. The Russian bookstores are already collecting some interesting statistics from the exercise re the types of books returned, full demographics of the reader and of course volumes. There are many questions, royalties, rights, store cash flow, discounting, personal information etc. It is also easy to envisage a marked rise in criminal opportunities but it is certainly a very brave step in a new direction. It’s either the maddest or the brightest initiative to happen and we watch with anticipation on how it develops. What is without doubt is that all books deserve a second life. The Cape Town Book Fair was certainly different. The aisles were jammed packed with people but not just the trade but ordinary people who had come in their thousands to look, handle books and even buy books. It was truly uplifting to see so many children there and perhaps it is a salient lesson that Bok Fairs are not just about the trade but about reaching the people. The other marked difference was that the Fair was certainly about books. Not digital ones but physical ones. I could only find one stand that offered digital services and although widely publicised it was empty of representation and visitors. Africa and South Africa are not immune to the digital issues but it is certainly not top of their agendas. Publishers such as Brian Wafawarowa, MD of New Africa Books, are certainly switched on to all the issues. He gave a enlightening and thought provoking speech at the IBF conference on both Publishing in Africa from both an educational perspective (the sector that dominates the market) and some interesting insights to the potential role of publishers in the future. We often dismiss the developing world and focus on the two dominant markets of the US and UK. What is clear is that all countries are not born equal in the digital world of publishing and that the consumer and markets will eventually dictate the winners, looses and pace of change and what works in New York and London may well not be adopted in other places for some time. The following is an extract from a speech I gave at the IBF (International Booksellers Conference) in Cape Town last week. It relates to the digital issues in the developing world. In South America, the Internet is starting to be universally adopted. If we ignore the special case of the Falklands, the two economic powerhouses of Brazil and Argentina clearly are moving ahead in terms of penetration and adoption. If we look at Asia the picture is somewhat more confusing, comparing highly developed countries such as Japan, Taiwan, and South Korea, with strong growing economies such as India and China and less developed ones such as Bangladesh is difficult. However, we can’t ignore the percentage of overall users already connected in India and China and can only expect this to rise significantly. This geographic region is significantly advanced in terms of infrastructure and the technology investment and these will fuel further growth. Africa’s lights are still switch off. Those countries that are potentially moving are those closely aligned to the western economies, South Africa, Morocco, Egypt and Nigeria. Africa doesn’t have the telecommunications infrastructure to fuel growth and in particular South Africa is still heavily reliant on that old sea cable. Things will change with mobile GPS, Wi Fi etc, but growth is restricted today and the resultant environment and initial usage may well be different as a result. It appears that the Internet needs somewhere around 60% to 80% perpetration to take off, which is a long way to go for many in the developing world. We must also look at consumer behaviour in the developing world. Consumers may have a PC in the house but if it doesn’t have high speed connection it is very limited it will limits the potential. Many in these countries have connectivity in the office but not in the home. The Indian government has recently declared its intent to connect all citizens to high speed broadband by 2009. Although the word ‘all’ is a bit loose, the intent and impact is potentially massive. In many countries, initiatives are coming from the government and specific sectors such as education. Libya is investing in the $50 PC programme and China’s has stated its aim to replace text books with 165 million ebook readers. We may find ourselves no longer talking about the haves and have nots, but the connected and the unconnected. This week Steve Jobs announced that Apple would make its Safari Web browser available for Windows based PCs. The gloves are coming off all over the Microsoft empire and potential wars loom. This is a significant step forward for Safari. Jobs claims it would have twice the performance capability of Microsoft’s browser but importantly Apple has declared a desire to go after the half a billion downloads of Apple’s iTunes software to Windows users and shift the application focus squarely on the Internet. Microsoft has currently 80 percent market share is a continuing threat to its competitors. Safari’s current market share is currently about 5 percent with Firefox, the open source browser, about 15 percent. Whatever happened to Netscape? The broader appeal of the browser might have implications for Apple’s new iPhone, its interfaces and compatible applications. Browse this space. Skype has unveiled Skype To Go, a new way to call anyone worldwide. As part of the global roll-out of Skype Pro, users can talk to their best friend abroad from their mobile phone for as long as they want without it being expensive. Users can sign up to Skype Pro for e2.00 per month and, as a Skype Pro customer, they will receive a Skype To Go number at no additional cost. To activate the Skype To Go number, users choose the friend or family member they want to call who lives abroad. Then users simply enter their international number and in return, Skype To Go will give them a local number to use instead. Calling one's friend in Australia now costs the same as calling one's friend across the street. Used books have always been here but the Internet is simply make them more available. First came ABE and Alibris, then Amazon and now eBay. Gone are the days when private collections only had one channel to and Albris now suggests that `house clearances' will become a rarity. For collectors, it may be difficult to gauge a seller's ability to accurately describe a book, its condition and its faults with the descriptive terminology used being often a different language to many. ABE have embarked on a scheme that is based on the seller’s rating. Apparently the scheme is based on 5 Stars and aims to help promote those booksellers who reject the least number of orders and receive the least number of returns. Obviously those sellers with a higher rating will benefit from increased buyer trust as well as greater resulting revenues. Buyers will see a dealer’s six month rating in the search results, and can also view a dealer’s 3, 6, 12 and current monthly ratings. The scheme doesn’t appear to deal with sellers who ‘white label stock’ and have it drop shipped by a 3rd party. ABE are waiting for reactions and comments from their sellers’ before implementing the scheme. Are Amazon going to be Riding the Bullet? Newspapers and magazines have always provided publishers with opportunities to get their titles reviewed or serialised and into the public eye. Serialisation once offered direct and often high supplementary income. However today we read in today’s NY Times that this is now potentially shifting in the US market. There will always be that conflict where the newpaper wants to tell it all versus the publisher who wants to lead you to the book. As revenues change then this issue gets more defined. At the same time we read in the National Examiner that the next Stephen King thriller "The Gingerbread Girl," a 21,000 word work, will be published in its entirely in the July issue of Esquire. What does Esquire and Stephen King know that others don’t? Mr. King made history with his serialisation of ‘Riding the Bullit’ in the late ‘90s when he released it by instalments as digital downloads. Today it is amazing that others have not followed his lead, or should one say the Dicken’s model and published digitally by instalment. Some have done so with new authors by why not with established ones? Can you imagine the explosions that would have happened if JKR had published the latest Potter this way? Both the digitisation market and potentially pod market would have moved on with a leap and the tills would have been ringing and the hardcopy would have still been in-demand at the end but at a maybe at a better price. So while the jury is out on the Latest King foray into men’s top shelf magazines there remains the issue of the serialisation and reviews in newsprint. A well-chosen slice of a book in the appropriate magazine can jump start a publicity campaign. According to the chosen journal, it can add weight and importance, create noise or appeal to a certain demographic. Today’s weekend paper’s are weighed down with pages upon pages of reviews and serials but do they shift units in the market or act as secondary sales opportunities for the papers themselves to drop ship to the consumer who in reality ‘never leaves the page’. Are the self serving the newsprint and in fact stealing the larger market? The questions raised in the NY Times cover the science of too much versus too little or just right reviews. This is always a subjective issue. The more that is written, the less the need to read the title, but the less that is written or relevant, the less the draw to the title. It is interesting that Amazon is quoted as expressing an interest in first serialisations. An obvious step for Amazon and one to watch! The premise of what you say is absolutely correct, search is fundamental to discovery and our switched on lives. I don't think anyone is in dispute here. What is in question is what Google and MS want to be when they grow up. If they merely want to sell ad space great no problem. If they want to sell books, which one has and the other hasn't decided on, then that is different. There is also the thorny issue of the Orphan Act and potential associated ‘land grab’. The ownership of the digitised copy – is not really touched in your article. If rights revert or the book gets 'lost' in the RUC or OP list then 'scan first and ask later' could be a real issue. The problem is we are looking at the issues in a one dimensional way and anything can work when we argue in this manner. Rights are licensed not owned, there are term times there are constraints. Can authors choose to elect out if rights revert? Will Google use copy to publish albeit through a digital only format? Who will control resolution and will it remain persistent? Many questions are not answered but many assume that they know best and ‘pooh pooh’ any debate. Forget Harry Potter’s latest adventure and June 21st there is something potentially far larger happening later in the month. 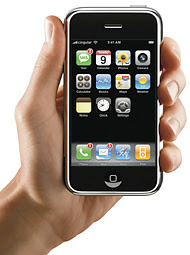 After six months of anticipation, three new television commercials for Apple’s iPhone divulged the product’s release date and it will go on sale in the US on June 29, 2007. Apple has formed an five-year exclusive US alliance with A.T.&T. and has still to announce its international partners. The first two iPhone models are priced at $499 and $599 for four- and eight-gigabyte storage options, respectively. The phone does not have a hard disk and is based on a basic version of the Mac OS X operating system, comes with a 3.5-inch screen that can be used either vertically as a phone or turned horizontally to display video or still images and is less than half-inch think. The iPhone has three radios - cellular, Wi-Fi, and Bluetooth - and is advertised as having 5 hours of battery life and 16 hours of audio playback when used as a music player. Innovation is also provided with a technique called "multi-touch," which is based on a series of gestures with one or two fingers. For example, it is possible to shrink or expand a picture on the screen by simply sliding thumb and finger apart or together. This will set the standards for all to follow and force the pace of device convergence. It is hard to see ebook readers surviving this onslaught and Mr Bezos will have to pull out all the stops if he has any chance of winning the Mobi Vs Adobe, or Jobs Versus Bezos battles. Nice threads sir! Marks and Spencer have now created the suit for the man with everything! A suit made from a fabric that transforms the inside lapel into an iPod control panel. Instead of fumbling around to change volume or channel you simply press a piece of fabric. User can also skip tracks and rewind songs. Sounds straight t out of ‘m’s Bond outfitters! The only problem is when you are squeezed into a busy London tube and your iPod goes out of your control. Silksoundbooks.com have launched a new digital download venture with 60 titles and expects to have 1,000 within three years. There are several interesting aspects to this. Firstly it is being backed by top tier actors such as Bill Nighy, Judi Dench, Richard E Grant, Jane Horrocks who may take shares in the venture in lieu of fees. This certainly gives them an edge and a vested interest in making happen. Secondly the focus is on unabridged English classics an obvious approach and one which aligns known names with known actors. Thirdly the price is a flat rate £7.95, a clear logical price point and one that will be attractive to many. Fourthly the files will be on MP3 and iTunes compatible formats, keeping it simple and aligned to where the players are. Fifthly they don’t need the overheads of the physical channel and have some graet names to advertise the wares to a wide audience. This is a significant step and is equal to when the likes of Wordsworth classics first put out the £1 classic. This is common land and it will be interesting to see how the high price points currently given to audiobooks will survive this broadside. Well done! The National Archives has launched a ‘wiki based’ site to help access its huge materials that spans 900 years from the Doomsday Book to today. It has been suitably named ‘Your Archives’ and is aimed at sharing content, submitting articles and uploading transcripts of documents. The national Archive is aware that there is a huge volume of material to add to the catalogue and this way it will be more productive than them doing it themselves. If you can’t get all the content from the publishers why not get 10 million books from the universities and libraries? Unlike the publisher program Google will give the universities digital copies of the books they provide and state that they will also digitize the books "in a manner consistent with copyright laws." An interesting statement, given the universities don’t know who owns the copyright of books other than those in ancient tomes which are clearly in public domain. It is hard to knock the initiative and the result should provide them with a significant repository of content which will be public domain and therefore free to render any which way. So we can see lots of old books coming back along with no doubt a number of orphaned works leaving just the current lists to publishers. The BEA lived up to its reputation for creating lots of news and the digital word was certainly hot on most people’s lips. So what caught the eye? The Espresso Book Machine Model 1.5 machine sat boldly under the Crystal Palace for all to see. It is currently eight feet long and five feet wide and attracted much attention. It has a smaller brother apparently on the way but has still to drop in price to make those heads really turn. A StarBOOKs or Costabook could certainly be interested in serving books on demand as you wait for that skinny latte but this one is heading off to a library. Although it has 200,000 out-of-copyright books through the Open Content Alliance, 2,200 World Bank titles, and Arabic-language books from the Library of Alexandria, these are hardly titles to die for or to read over a doughnut and it remains to be seen whether the company can collate a sufficiently large base of attractive content. Ingram Digital is no longer a ‘venture’ but a group. Interestingly the news that it had struck up a deal with VHP (Macmillan US) went largely unrecorded. In the digital world this was a significant story and leads one to speculate exactly what the global strategy is for Bookstore and MPS. However, it is good news for Ingram and VHP in the US. There is a new digital appointment within the trade environment who enters not from music, newsprint , sales, editorial but from the major digital force that is Elservier and it is going to be interesting to see how Hachette-Livre is going to move now. Rights reversals continue to bubble along. A close colleague used to say ‘ be careful what you wish for’. Publishers need to be wary of changing established practices that have stood the test of time just because the end format is changing. It is highly unlikely that any but the highest tier of authors would sign away their works for what would be clearly a lifetime plus. What could happen is the emergence of new term and revenue rules which would be easier to reverse and activate. This could lead to some works enjoying a second wind or even a first one. We now have DADs (Digital Asset Distributors) which is different from Digital Asset Management and so on. The forthcoming Klopotek conferences in New York and London have certainly gathered all the usual suspects plus those industry gurus Shatzkin and Bide and should be a very interesting. I will be speaking as a DAD and hoping to introduce the wider digital family of Mum, son, daughter etc. eBay has said it would begin selling radio airtime to advertisers this week through a partnership with Bid4Spots. It will offer advertisers a way to buy unsold radio ad slots from 2,300 radio stations in the top 300 media markets in the United States. Advertisers can buy airtime on the eBay Media Marketplace, which was originally a cable television ad forum which began in March. The eBay ad exchange has been disappointing so far but it is hoped that widening its remit to radio will reverse this. Bid4Spots works as a so-called reverse auction with advertisers who join designating what they are willing to pay for a spot, then radio stations with the available airtime make offers to win their business. Google, paid $1.24 billion to acquire dMarc Broadcasting, a rival to Bid4Spots and in April, it did a deal with Clwear Channel to sell ads across the company’s 675 stations through its AdSense platform. The interesting issue is whether the opportunity to effectively auction and buy radio slots will move advertisers to radio away from other sectors. Radio is potentially a great way to promote books!